Remarks: Kobe2602, is analog of Kobe0065 , is is a potent and selective RAS inhibitor, which exhibit inhibitory activity toward H-Ras GTP-c-Raf-1 binding both in vivo and in vitro. Kobe2602 effectively inhibits both anchorage-dependent and -independent growth and induce apoptosis of H-ras(G12V)-transformed NIH 3T3 cells, which is accompanied by down-regulation of downstream molecules such as MEK/ERK, Akt, and RalA as well as an upstream molecule, Son of sevenless. Moreover, Kobe2602 exhibits antitumor activity on a xenograft of human colon carcinoma SW480 cells carrying the K-ras(G12V) gene by oral administration. 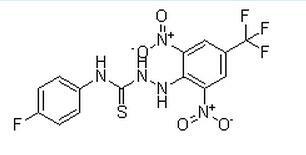 Kobe2602 may serve as a scaffold for the development of Ras inhibitors with higher potency and specificity .